In recent weeks the eyes of the world have been fixed on Ukraine, where some tragic events have unfolded. The troops of the former government, under the direction of then-president Victor Yanukovich, fired on protestors in Kiev and elsewhere in the country over a several-day period, and killed dozens. The protestors began their demonstrations after yet another effort, late last year, by corrupt forces in the government to cut an unfavorable energy deal with Russia. The current state of the crisis, as of the time that I am writing this blog post, is that the president has been ousted and is now at large somewhere in the eastern part of the country – perhaps in Crimea. A warrant for his arrest has just been issued by the current Ukrainian government, which has replaced the president by calling for new elections. Needless to say, these events are deeply troubling. The tragic loss of life is incredibly troubling and has been recognized as such by worldwide sources. But I do not want to focus in this short blog post on the macro story as it has been carried by the mainstream media. What I find deeply intriguing about the events that have unfolded in Ukraine over the last few weeks is the small but impressive effort by some of Ukraine’s orthodox priests to quell the violence. You’ve probably seen the pictures – usually two or three priests, standing courageously in the middle of the street between the protestors and the troops they are opposing. These priests, as far as I can tell from the accounts that have been offered about them, have been endeavoring to keep the peace between the warring factions. And their courage raises some interesting questions for Christians about circumstances in which the actions of governments are unjust. In the Christian tradition there undoubtedly is space for a just war view. So it is indeed possible, in circumstances in which governments and rulers are engaging in nefarious actions, for Christians to go to war against them. But an important component of the just war tradition as it has been developed down through the centuries in the Christian tradition is that war-making should always only be a last resort. Some major Christian leaders in the twentieth century, recognizing this, carved out space instead for another option – civil disobedience. Martin Luther King Jr. is the most famous of these twentieth-century Christian leaders. King advocated a form of social protest that was thoroughly committed to non-violence. Under no circumstances, King thought, ought the civil rights demonstrators to agitate for violent changes in their society. But the civil rights demonstrators nonetheless sought to bring about social change. Instead of violence, they focused on the production of cultural tension. The idea was to use non-violent means to produce so much tension in society that the segregationists would be forced to re-examine their policies. And ultimately King and his followers were successful. Of course, the time has now passed in Ukraine for civil disobedience. Unfortunately, the events of the last several weeks spiraled out of control and violence erupted. And my impression from the news reports is that it was the government troops in many cases who initiated the violence. 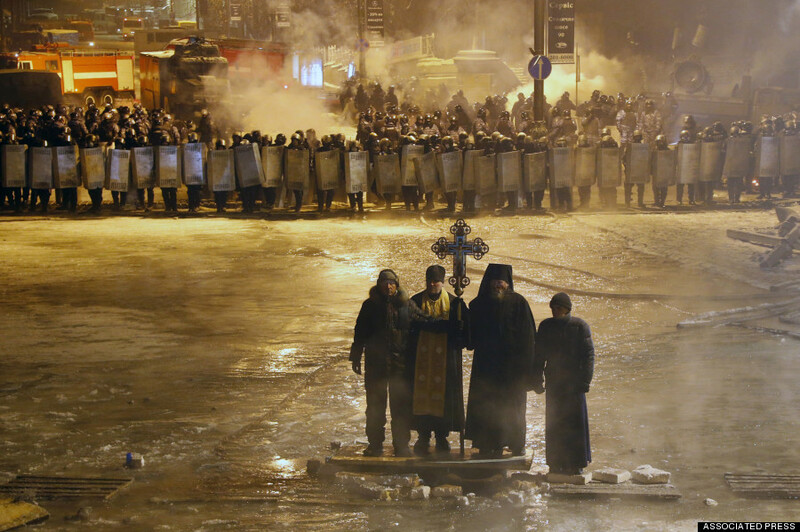 But whenever the people of Ukraine or of one of the other countries of Eastern Europe again feel the need to agitate for social change, my prayer is that they will remember the peacemaking actions of the orthodox priests over the last several weeks. And my hope is that, instead of turning to violent forms of confrontation, they will instead act in accordance with the deeply Christian ideal of civil disobedience, as held up by twentieth-century icons like Martin Luther King Jr.